THE GREEDY JEWISH MONEY LENDER who has no conscience has reappeared some 400 years later since Shakespeare introduced the character of Shylock in his play, The Merchant Of Venice. Bernard Madoff, the founder of Bernard L Madoff Investment Securities, is accused of running a $50 billion “Ponzi” fraud scheme. Madoff’s firm is now in liquidation due to an FBI investigation of his criminal activities. Bernard Madoff is also the former treasurer of the American Jewish Congress which lost a “significant” amount of money through their investments with Madoff. And a “significant” number of Jewish charities throughout world-wide Jewry have also been “stung” by their fellow Jew, Bernard Madoff. Although the entire world is aware that Jews control finance, entertainment, the press and the media, now it is widely known that if a Jew’s greed becomes insatiable, he will stop at nothing to defraud even his own friends and fellow Jews. Why is this? It is because the Jews have as their ultimate authority structure, the Talmud and its interpreters, the Jewish rabbis. The Talmud teaches that the Gentiles are sub-human and can be exploited for Jewish ends. But when this “exploitation” takes hold of an avaricious Jew like Madoff, then the border between Gentiles and Jews collapses. 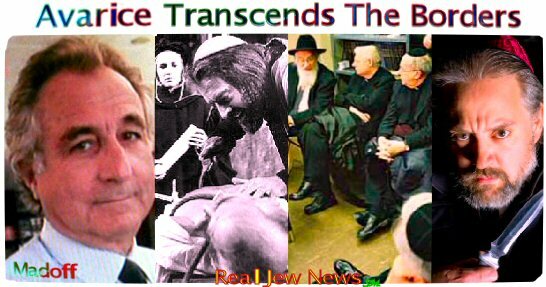 Well, apart from the article I just did this past Sunday: “ADL Calls Madoff Critics Anti Semites” @ http://www.realjewnews.com/?p=351 - I felt I was long overdue in posting an article on my former co-religionist, the Jew, Bernard Madoff. Everyone and their brother has been posting something on Madoff, but I bided my time until the “muses” came along as they did in Shakespeare’s The Tempest, to inspire me. “Aha!” meselfe said to meselfe. “That’s it! Madoff is a modern day Shylock,” I reflected, and the “script” just flowed off of my computer keyboard. Terrific! Shylock! Shakespeare and Dostoevsky have to be the all time intuitive “psychologists”, well below our Lord Jesus, of course. Shakespeare’s genius, especially his creation of Shylock and the creepy, demonic “inner evil Jew” made dramatically manifest to an audience is unsurpassed. Shakespeare had to have studied some of the Talmud or Kabbalah as well as know the British Jews of the era. It is an excellent touch in the montage to counterbalance the “loveable puppy dog” features of Madoff [which elicits sympathy], with both the classic film noir/stage persona of Shylock, and the photo of what must be the master himself, the young Orson Wells as the sinisterly handsome Shylock. Beautifully done, dear brother in Christ. Bravo! You know I think alot of this “bailout” money will go straight into Israel and towards Zionist efforts. how could one person do all that? No, others were in on this .I suspect his sons, wife and employees were in on this Pyramid . How many would like to place a wager that Madoff will spend absolutely no time whatsoever in a prison? He will go before a jury of fellow Talmudists that will choose to exonerate this man based upon testimony presented by a Talmudic Lawyer. They’ll concoct stories of how this man is a philanthropist and how he just exercised “poor” judgment and how he deserves home confinement,or probation for the rest of his life. What can one say about the mess of messes that has unfolded in the financial crisis. The messes just keep unravelling. Where are the competent, just and righteous leader to run the levers of economic policy. We have useless so called “elites” doing a messy job of it. Was reading an article in an accounting magazine which was called beyond “CHINDIA” , meaning beyond China & India. Russia will dominate the whole world in the not too distant future. The world needs Russian leadership in a positive way. There may actually be more to this story–perhaps a scam on top of a scam. I read an article by Muhammad Rafeeq (who has a background in finance/banking and was actually helpful in getting Malaysia out from under the IMF) on the iamthewitness website that talks about how this may not be a ponzi scheme afterall. He suggests that Madoff was really operating a hedge fund (there is a pdf file on this on the iamthewitness site- right side). Rafeeq suggests that the fund may have money due to the ongoing collapse, but by calling themselves a ponzi scheme, the investors may be able to get back money that they otherwise wouldn’t have been able to get. Similar comments (that this wasn’t a ponzi scheme)were made by Dr. Bob Chapman (international forecaster) on a radio show. The most recent weekly webcast from the larouchepac website also hinted that there was much more to the story. Though zionist media don’t pay any attention to Larouche, it looks like he is actually doing everything he can to keep the world from collapsing into what he says could be another dark age, like when the Lombard banking system collapsed in the 1300′a (usual suspects probably). I truly never believed in evil until I learned about these bankers, their role in all of the wars and their role in imposing poverty on 3 billion people via the IMF (international murder fund). 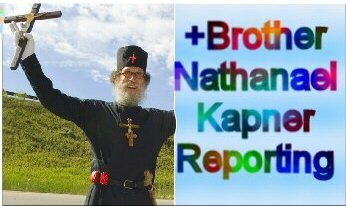 Thanks for all of your hard work Brother Nathanael. I hope the ADL is leaving you alone this Christmas season. When Obama learned of Biden’s speech, he tried to explain everything with rhetorical exaggerations. However, Biden’s remarks gave food for thought, taking into consideration the fact that former secretary of state Madeleine Albright described his remarks as statement of fact. The general public has been prepared for a possible mega terrorist act with hundreds of thousands of victims. The expectation of another major terrorist attack, Chossudovsky wrote, became a part of the US military doctrine to justify possible preemptive strikes, i.e. aggression. The analyst also wrote that the US administration was aiming the efforts of the national security services at the liquidation of the consequences of the Massive Casualty Producing Event. Moreover, the US establishment believes that such an event may unite the Americans. Tommy Franks, the then CENTCOM commander voiced this idea in 2003. He particularly said that another event with many casualties in the USA would revive the support of wartime laws. Franks also said that such an event would mark the end of democracy in America. To put it in a nutshell, it would mark the beginning of the era of dictatorship. Bernie hasn’t stolen one dime from one Jew. Their money has been converted to Sheckles and is sitting safely in a bank in Is-it-real. The dollar is about to collapse so the rats are abandoning the sinking ship. This link is the best connect-the-dots summary found so far that describes the identified Cultural Marxism doctrinal core marriage between Freud and Marx from the Frankfurt School guiding the Soros-Clinton-Obama Mafia called “The Cloward-Piven Strategy of Orchestrated Crisis” with well-documented links, and of how Obamquin the Golem has always been in the middle of “the incestuous radical left” of the Democrat Party and its patron saint, Sam Alinski for close to twenty years. Both Hillary Rodham Clinton and Barack Hussein Obama were students of Alinsky, who pushed the doctrine of gradual socialist revolution through the use of Middle Class activists and organizers. Alinsky in turn inspired Cloward-Piven. Somewhere under the Madoff scandal is more of the “manufactured crisis” in the Cultural Marxism war and exploded in the Revolutionary 60’s. Madoff is a Zionist Democrat and big party supporter. Financial investigators ask “Where did the money go?” Maybe to Money Heaven somewhere underneath the Negev Desert, and Madoff agreed to be the witting “fall guy” and let the exclusive flag-ship hedge capital fund take the torpedo for the sake of the “Progressive” cause of the Obama Mafia. Jews do not let their foundations of wealth collapse unless they have already prepared a back-up sometime beforehand. Among the issues that Christopher Cox said are under investigation in a sweeping internal probe of the bungled case is that a Madoff family member was married to a onetime SEC official. Madoff was handling billions in tax-exempt funds for so-called “charities”, especially Jewish ones. The IRS says the biggest potential for IRS fraud are these tax-exempt non-profit charities doing deals with other tax-exempt non-profits–all posing as do-gooder “foundations” and “charities. A huge part of the fraud is tax evasion–one non-profit “donating” to another non-profit “charity”, which is nothing more than money laundering. Then the charity takes a cut, then converts the bulk of the donation to an offshore account for the donor’s use later—out of sight of the IRS, SEC, and US banking laws. These immense charitable and non-profit foundations and trusts, by law must donate a minimum of 7% of their holdings each year in order to retain their tax-exempt status…get it? You can be sure that ONLY the 7% minimum is paid out every year and the rest is stashed off-shore. In the meantime, the Madoff scandal publicity conveniently broke just before the meeting of the Electoral College on December 15. As such, it served to sensationally distract in MSM the already woefully unreported patriotic “grassfire” activism tackling several flanks of the Constitutional crisis encapsulated by Obama’s election. These efforts are being filed through the Supreme Court, the state and federal court systems, and also pressuring congressional members in an effort stay the Congressional Electoral Vote Count on January 8, 2009 until Obama proves he is “qualified” to be President per the mandatory legal Constitutional requirements as a ~natural born US citizen. For those not familiar with the several step process of indirect election of the president and vice-president in contrast to direct election of members of Congress, wiki “Electoral College” to get an idea where in the US electoral process things are and the grassfire efforts, and just how big this public media “chaff” about Madoff actually is, as is the invitation of the pseudo “America’s Pastor” Rick Warren to make the invoking prayer for the presidential inauguration. The Obama Mafia has spent close to a million bucks to block the presentation of a $10.00 copy of an authentic birth certificate and other relevant documents from the just demands of ‘We the People’. How long before the ADL insist the character of Shylock not be introduced as Enter the Jew in the play. The world is in the grip of the most powerful bunch of psychotic parasites ever to wage war on mankind. God help us all in the years ahead. Merry CHRISTmas to all here and around the world who defy them. Two years ago I wrote an article forecasting this debacle. It was mostly based from a religious/political point of view. I said a wake up call was coming to those who give foolishly to give to Israel in the name of Christ, despite how Israel hates Jesus. When the pocket books of Americans are emptied, they will finally see that they have been robbed and cheated. Charity begins at home, in America, First. Let us all rejoice in the birth of the Holy Child in Bethlehem who was born in desperate poverty. We all have a God-given spiritual faculty of Free Will, and with that Free Will we are all expected to submit to the Will of God. Truly, our contemporary World need NOT be the way it is. God is Good. God is All-Good. And if 6 billion human souls were but to decide in the next 24 hours to obey what our All-Good God wants for us TO DO with these lives of ours, we’d ALL have a personal and communal taste of Heaven here on earth! You caught on, man! I saw that article and just thought, man, he’s sucking the blood out of anyone, regardless of race! You’re still on top of the news, I see– and with a quick eye. The question is: if this is the tip of the iceberg, what’s the “next step” to “protect our money”? Digital accounts? Chipping? Will we need a “terrorist act” for our “national security”? What’s the next farce? Gold Medal to the Jew Bernard Madoff who lost $50 Bilion in cash and securities.It is the largest investor fraud ever attributed to a single individual.I wonder how much money has been laundered into Israel? How pathetic is it when Jewish organisations worldwide are rallying around this crook. Instead of saying that he should be stripped of all his assets and sent to jail they are trying to paint him as someone who also ripped off other Jews. Is that supposed to make us feel better? The ADL and the Jewish controlled media in the US are trying to divert attention away from the issue at hand by focusing on so called anti Semitic comments on various websites. I personally hate that word “anti Semitism” because it is misleading and inaccurate because most Semites in the world today are Arabs. 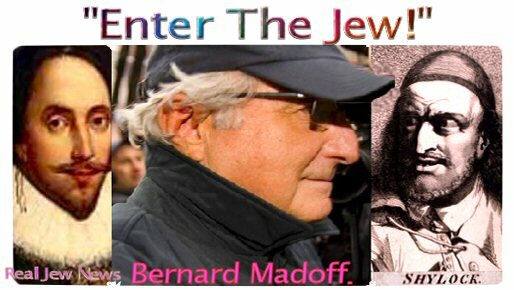 Madoff is an Ashkenazim Jew. What Madoff did and what has happened because of the global credit crunch only proves that financial Jews cannot be trusted with your money. America is in a financial mess because of the controlling 2% religious minority. They have totally mismanaged the US economy. Madoff is a bad Jew and he will burn in hell on judgement day. Abe Foxman National director of the ADL is a disgrace for trying to justify his actions by diversionary tactics i.e. “There has been an upsurge in anti Semitism” Foxman is not even a Semite in the proper sense, he is an Ashkenazi Polish Jew.Foxman believes that no Jew can do wrong. My advice to all our readers avoid doing business with the Jews in any way shape or form. Yes, brother Abe must take fast and appropriate measures apropos de Shakespeare LOL. I would imagine calling Shakespeare “a hater”….. This is exactly his style of treating people who do not agree with him. And I would not be surprised if he would be given the Nobel prize for Literature in 2009 for his “discovery”…. At least our Khazarik/Turk/Jews brothers know how to do this, cook a lot of Nobel prizes for their “smart boys”. Now they can have one more Jewish Nobel winner!!! Congratulations to our brother Abe on his “achievements”. Hope GOD will forgive him. The plan was never to burn or “sting” other Jews. All the Jews who invested in Madoff were making large sums of money (around 25% annually). What happened is it got exposed too soon, and thus many Jews got burned. If it would have gone according to plan, the Jews would have taken their money out before it collapsed, leaving only the organizations and banks backed by Gentile money to suffer. The ponzi scheme has been going on for over 14 years. Do you REALLY think these Jewish groups didn’t know what was going on? I sure hope not, because if you’ve learned anything about the Jew you will know his ways and see through his plans. This is simply the biggest jew to get caught swindling money. What about the thousands of other jews who do the same every day? What about the entire state of Israel that lies to, cheats and steals from the whole world? Madoff is just an example of a larger problem. Yet more jew lies. Now it appears 2 jews who professed a touching love story around the supposed holocaust made it all up. I doubt the entire “holocaust” even happened. MANY of the stories from WW2 have been proven to be fabrications. The gas chambers may be just a myth as well.